With summer days upon us we kicked-off our summer programmes with a week long residential in Glendalough. .
We arrived in St Oliver’s Park to both happy and nervous children. For some it was their first time to leave their parents. With the buses full to the brim with children, cases, sleeping bags and food supplies we headed off for Teach Caoimhin in Glendalough. We arrived safe and well and had 20 excited children running around finding beds and exploring the house. After dinner it was time to explore our new surrounding and off we tracked through the forest and around the lake. The group excitedly gathered wood for a bonfire and played hide and seek in the woods. After a long first day it was time to gather round the bonfire and listen to some old stories. Eventually, in the early hours of the morning, the last child finally fell asleep!! The days in Glendalough were filled with exploring the woods, panning for gold, picnics in Glendasan, driving through rivers, art and crafts, visiting St. Kevin’s Chapel and plenty for all. The trip to Wicklow was a great success and both young people and Exchange House Youth Workers had a great time. We hope that a residential week will now become permanent annual event our AfterSchool Porgrammes each summer. 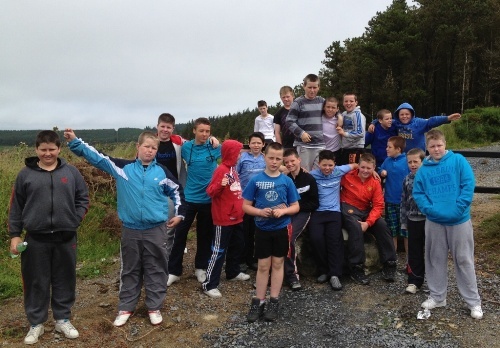 The residential to Glendalough was offered as part of Exchange House Youth Service summer programmes. Our summer programmes were run over eight weeks. Up to 200 young people from the greater Dublin area were included in our summer programmes. The Glendalough residential is a way to engage young Travellers in the school system and to promote high attendance in the formal education system.